← High Scores at Low Cost: A Taxpaying Parent’s Dream, A Bureaucrat’s Nightmare. Intended Setting: The intended setting is a Texas classroom of thirty retarded, good-humored, English-speaking orphans of rich Europeans who will soon return to their native countries of France, Italy, and Belgium and become neo-impressionists supported by the state and family wealth. The eight authors, nineteen consultants, and forty-one reviewer/consultant-specialists (one of these 68 people is actually a scientist -PhD, biology) state the first two of the above-mentioned setting attributes (Texas, thirty students). The remaining attributes may easily be inferred from examining the texts and the teacher’s annotated edition. For example, the ounce, pound, inch, foot, yard, pint, quart, and gallon are never mentioned in the entire six years of student texts. Mysteriously, dollars and miles are occasionally mentioned but these occurrences are undoubtedly the fault of some careless editor. The Newton – that ever-so-handy metric unit of force – is mentioned once. Rationale: One inferred rationale for this series is to screen the school children for seers, oracles, and prophets. For example, “Life Science” – the most complex of the sciences – is presented first and constantly refers to concepts such as pH, sodium chloride, soil properties, and CO2-02 cycles. These basic topics are then covered more than a hundred pages later in the sections of “Physical Science” and “Earth Science.” In “Physical Science” the chemistry section (discussing ionic electrical bonding on p. 181) precedes the physics section (that covers electrical attractive forces on p. 229). In the physics section, Newton’s three laws of motion are presented 1, 2, 3 – not 3, 1, 2 as is usually required for non-seers. the design goal facilitates teaching “High-Potential Students”, “Mainstreamed Students” and “LEP Students. Learning some science is never mentioned as a design goal. Objectives: The text contains sixteen chapters averaging about four lessons each. Each lesson states from two to four “Lesson Objectives” making a total of about 12 objectives per chapter. The numbers refer to the Texas Essential Elements – the state mandated contents of any curriculum. Diagnostic Procedures: There are no entry-level evaluation tests. Even though the sixth grade text is the sixth is a series, no prior science knowledge is assumed. The sixth grade text repeats most of the fifth grade material with some additions. Reading at about the fourth grade level appears to be the only skill required. The sample chapter tests usually have some questions that cover the objectives, but the tests cover far more than the stated objectives. The main emphasis is on cognitive skills at the knowledge level (memorization of facts). Instructional Procedures: A great variety of instructional procedures is called for in the teacher’s edition. Since the emphasis is on “process skills” – observing, classifying, predicting (and how! ), collecting data – which are best learned by doing, there are a wide variety of activities to fascinate the 12-year old student. (Like watching corn seeds grow in a glass with wet cotton – a nice second grade activity, so let’s just keep doing it!) Appropriate to the goal of avoiding all math, not a single quantitative experiment is to be found. 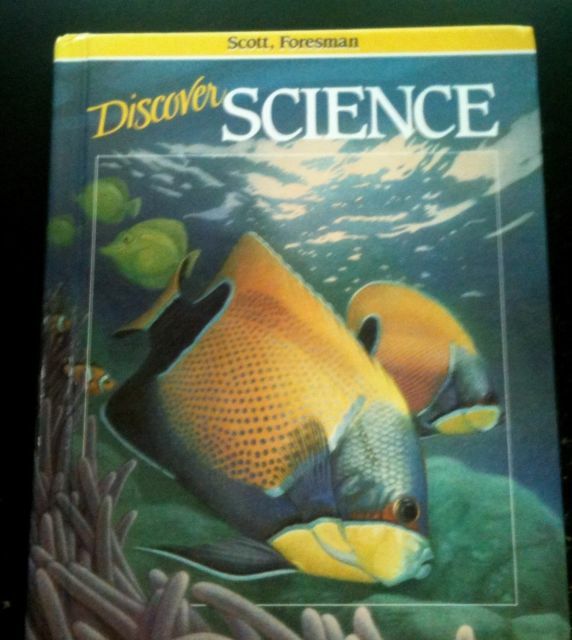 Materials/Media: As if the vapid 547 page text isn’t enough, there is the 650 page teacher’s edition, a work book, and other items sold by Scott, Foresman totaling over 50 pounds of cellulose for each copy of the series. In the Scott, Foresman “Discover Science Master Lab Kit,” and the “Convenience Kit,” meter sticks, metric tapes, and Celsius thermometers are included. But no scales (of any calibration) for measuring force are included nor are any needed. No volt meters, ampere meters, or ohm meters are needed, nor are db sound meters nor light meters any of which are readily available for $10 -$15. In the supplies category, it is noted that each student will use three pieces of graph paper (millimeters) during the entire year! One cannot help but wonder what these European orphans will think upon returning home to find their native schools use only graph paper notebooks for all science and math – reams and reams of it – what a waste when you only really need three sheets. This entry was posted in Education - K-12, Learning and Education, Reviews, Uncategorized and tagged charter schools, elementary education, K12, roger bacon academy, science, teaching. Bookmark the permalink.